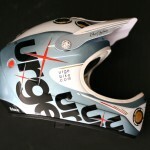 Urge Down-O-Matic Helmets. Sizing S/M (54/57cm) and L/XL (58/60cm). 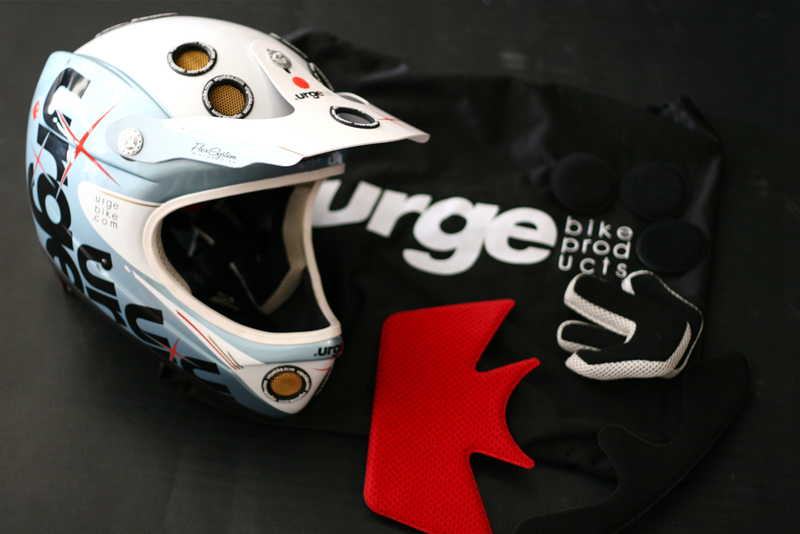 I learned about Urge helmets last summer and was intrigued by their unique styling and good looks; after seeing them in person at the 2010 Interbike show I had to get a hold of one as soon as possible. Since they weren’t in stores and not available in the US till late December 2010, I called South Shore Bicycles out of Colorado and got a Down-O-Matic to test. My first impression was the graphics was fresh and different. It just didn’t look like anything else out on the market and that a big feature (vent holes) of the helmet was thoughtfully integrated into the overall design aesthetics. Shown above are 5 colorways (L to R) Black Veggie, Palace White, Impact Black, Monaco Orange/Yellow/Black and Frisco Blue. 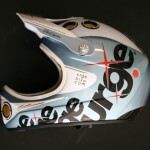 While most companies copy the big dogs, Urge rose above the moto-inspired themes and created its own identity. This type of thinking also lends itself well to being more innovative. Thinking different and offering a product at a good value is what customers want. 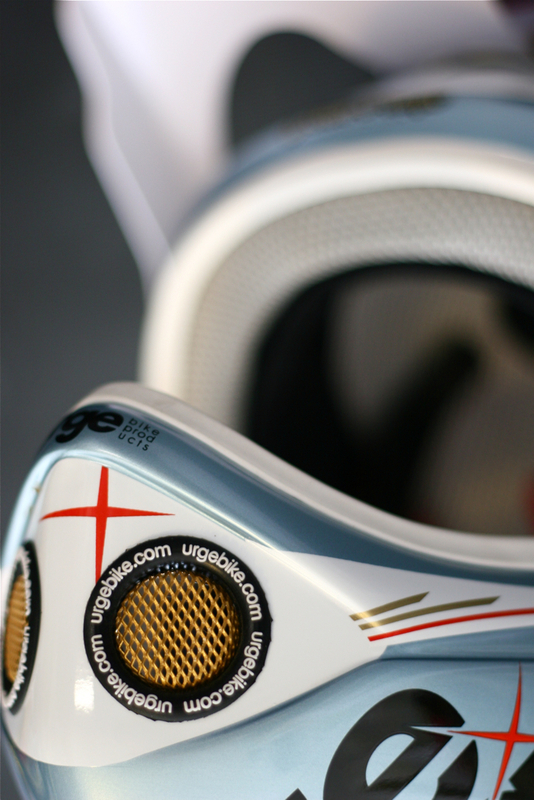 And Urge Delivers that in a light, well-vented and affordable product. The finish on the helmet is pristine and reminds me of a new car. The paint job is flawless. Black being a color that shows imperfections the easiest, I found none. Fabrication is superb. 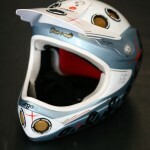 Along with the good looks, the helmet is light, the one tested in a S/M size weighed in at 1010g. 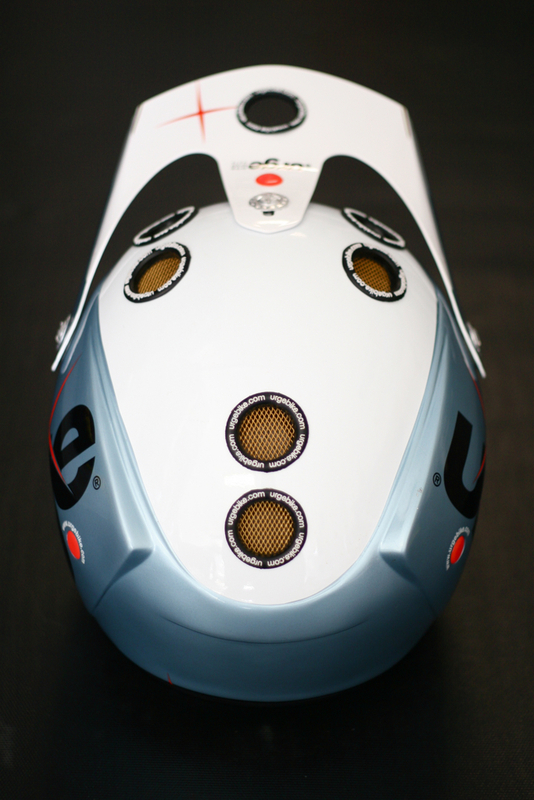 A noticeable feature of the helmet are the huge vent holes; 4 on the top front, 2 on the top rear and 2 on the face guard. These holes are grilled to keep debris out but their size and shape appear to be modeled after more lighter helmet design (often used in cross country and road helmets). 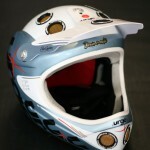 The construction is made from a fiberglass shell with a sturdy foam core like most helmet construction. 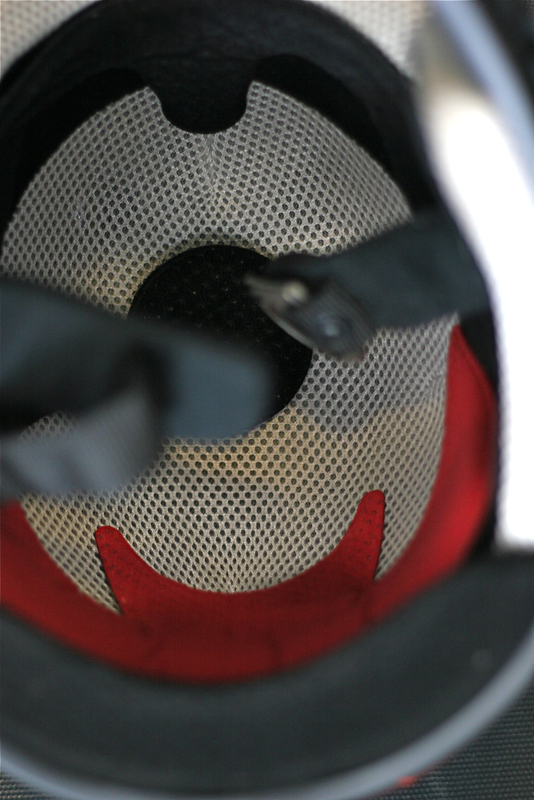 But unlike other DH full face helmets, the down-o-matic is lined with a double layer of light mesh fabric. This helps cut down on weight as well as prevents sweat from being soaked up — creating a more breathable interior that allows air to vent more efficiently. In fact, I can actually feel a breeze on top of my head when I’m speeding down a run. Something I’ve only felt with XC lids. 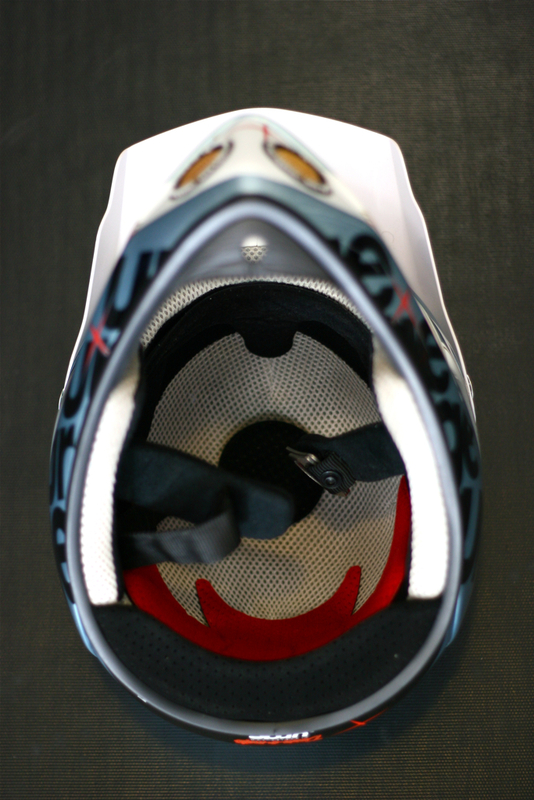 For medium to large goggle frame size, you will be limited in your choice. 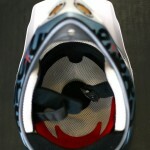 I have tried, Oakley, Smith and Thor goggles but these frames did not clear the opening. This could be a big deal if you prefer to wear larger frames because you either have a large face or perhaps you wear prescription glasses under your goggles. 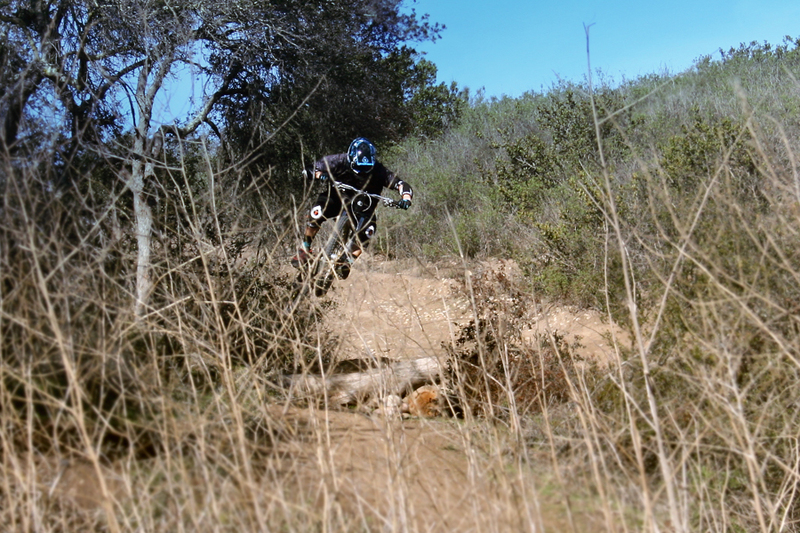 So far, the only goggles I have had success with are the VonZipper Sizzle MX and the Spy Optic Alloy. These work beautifully and there’s no issue. One manufacturing innovation I appreciate is the dual sizing. You’re actually getting 2 helmets in one. This is achieved by two sets of padding inserts of different thicknesses. In the S/M helmet, I use the thinner pads intended for a medium sized head, if I ever decide to pass this helmet on to my wife let’s say, it’s as simple as switching out the 3 pads, and I can hand this off to her in a minutes time. Very easy switch. 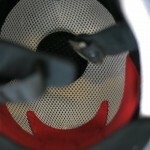 There is also 2 sets of cheek pads at the sides to get a more custom fit depending on your face size. With the 2 different padding size, I was able to mix and match to get the perfect fit since I was closer to a small/medium vs a true medium — not too many other helmets will accommodate for half sizes and this one does it. Bonus! Testing the Frisco Blue Down-O-Matic. Photo Erich McCoy. The comfort of the helmet is good and I might even say it’s great, but it isn’t plush. 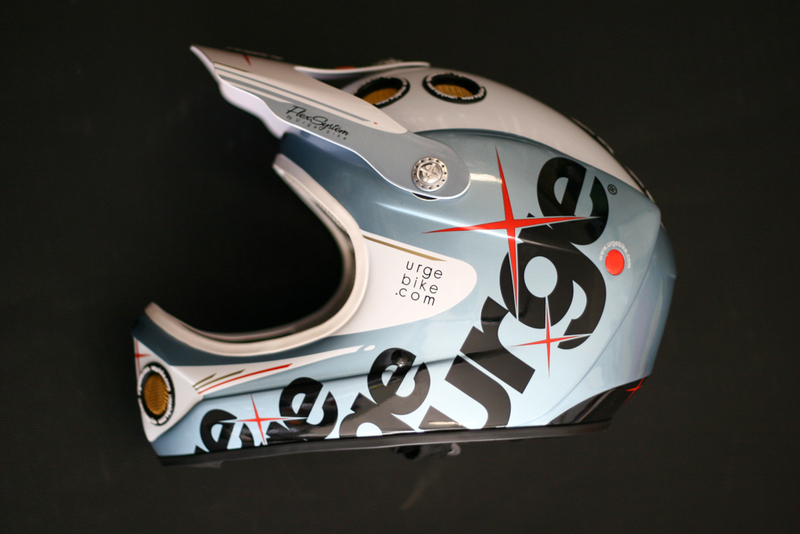 Knowing that this helmet was designed and tested by pro-racers, this is a matter of performance. Think of it as the race car, what goes on or in has to serve a purpose of getting more performance. Comfort can be derived from weight savings, your neck and shoulder muscles aren’t as fatigued. 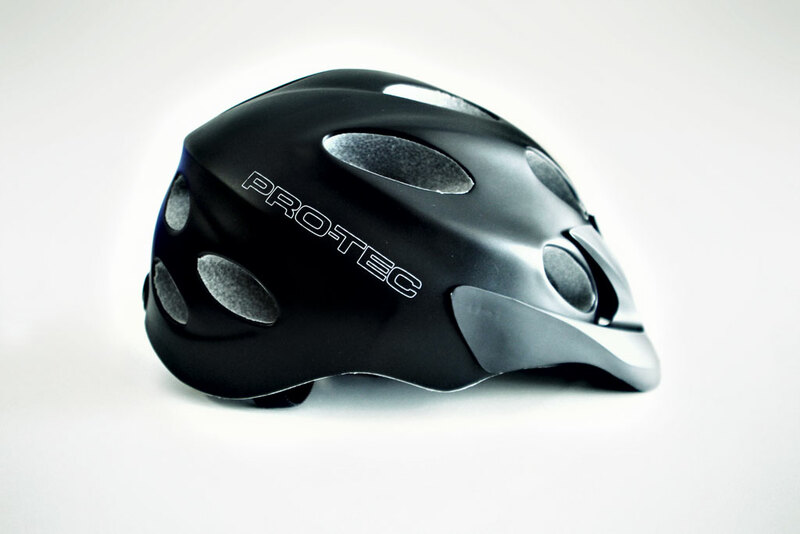 It can also be attained in ventilation, this helmet rides cool and if you hike a bike in some sections like I do, you can keep it on. That being said, after a few rides, the padding has contoured to my melon and feels about as natural as a full face can feel. Lucky for you all, I actually played the role of crash test dummy and took a spill right on the crown of my head. It was a relatively good crash, good meaning, I was dazed momentarily. First thought I had was, damn! I just ruined the finish on the helmet but then I thought, holy crap, I’m not hurt. Sore as hell and feeling like I had a hangover but not hurt. I got the helmet off and saw that I cracked the visor on its side, but the rest of the helmet survived with minimal cosmetic scuffs. 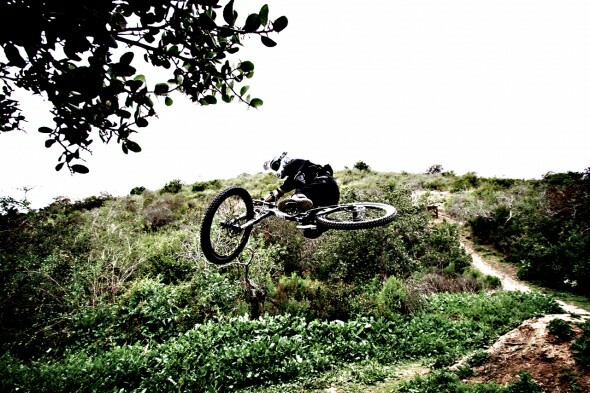 Granted, I was lucky I landed on a downside of a transition, on soft dirt, that minimized my injury more than anything, but the harsh reality of it is, without helmets, this sport would not exist. Structurally, I couldn’t find a flaw so the helmet can live to serve another day. I was bummed that the visor broke since it was designed to flex (and perhaps not break) but this is clearly a safety measure. 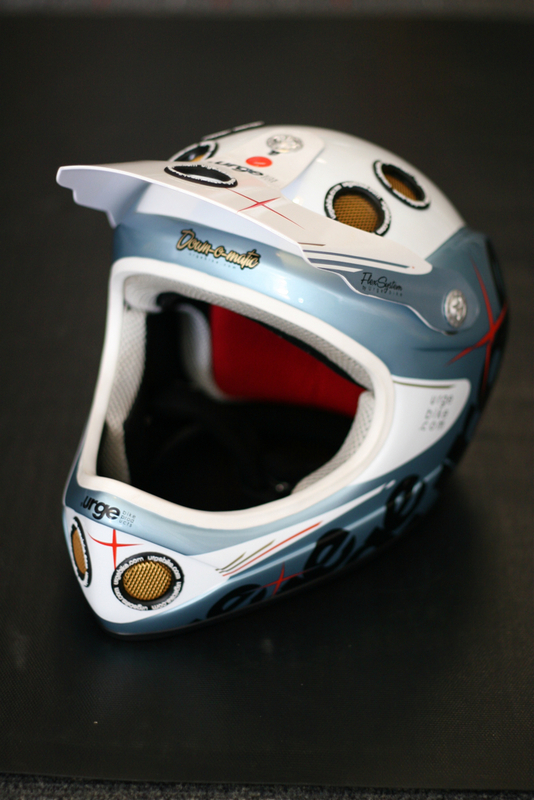 One that reduces the chance of the helmet shifting as a result of the visor striking the ground (or object) first and moving the helmet off the head. I think this is one detail where real racing experience and knowledge is specifically designed in. Its these types of details that new product introductions can distinguish themselves from a me-too product and I love them for it. Ever the earth-friendly minded company, (pictured left) the Veggie Linen model is intended to compete in the carbon fiber market. 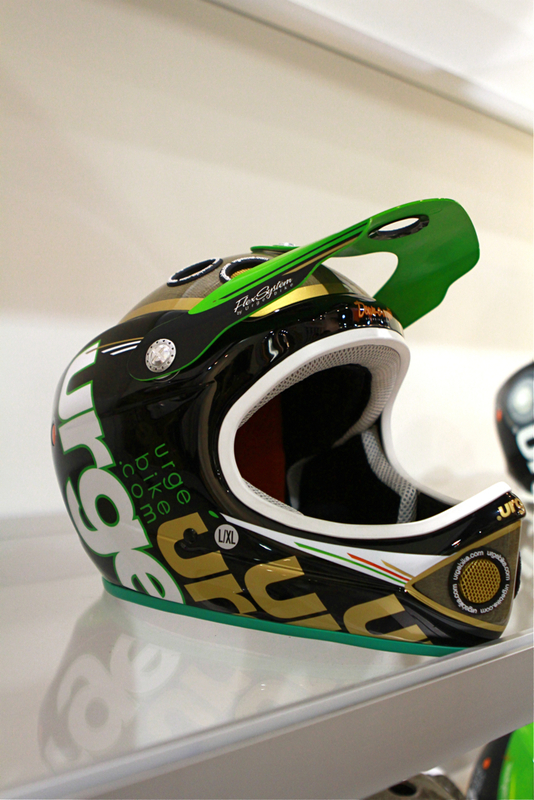 According to Urge: “The natural resources needed to produce this helmet are low because of the low energy needed to produce the fibres compared to traditional composite materials. 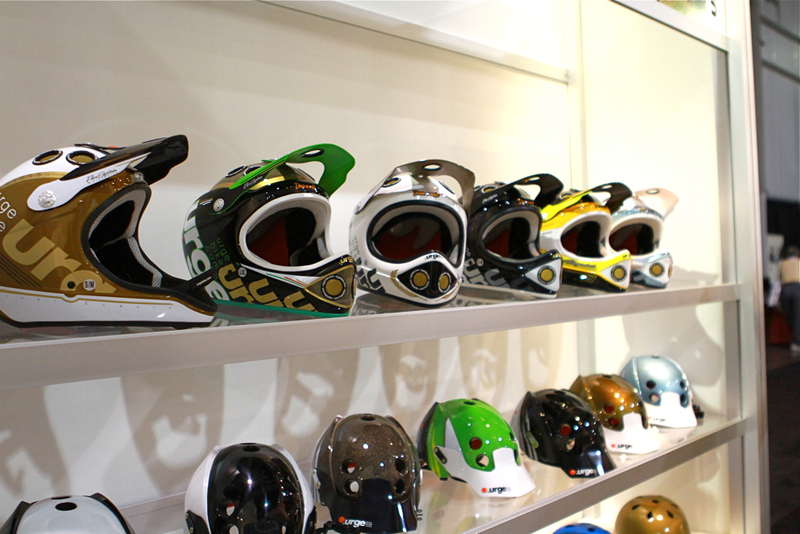 This also allows a healthier working environment of the people producing the helmet. Most of this helmet is naturally biodegradable, although it is not yet possible to make a totally recyclable helmet, the Down-o-matic veggie starts a new way of thinking about how helmets are produced…”. The Veggie Linen retails for $299.95. 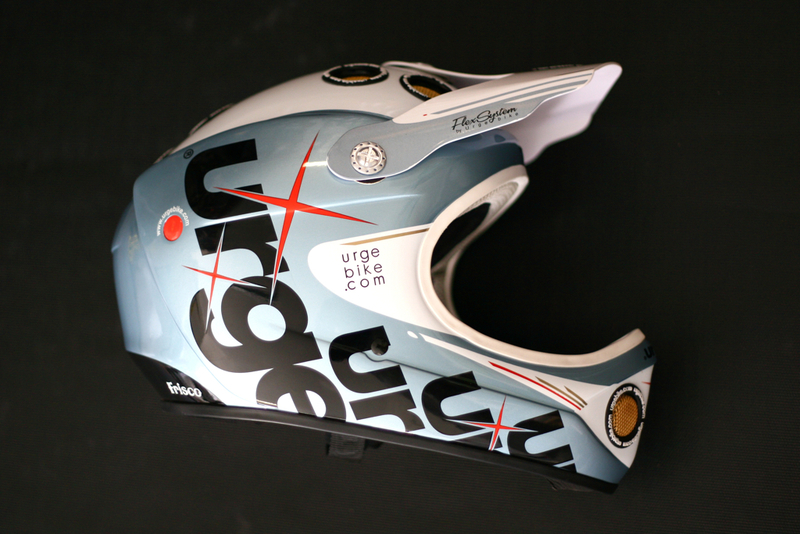 Urge Bike helmets is a French company located near Saint Tropez on the Mediterranean, much of the R&D has been done by Fabien Barel, a former World Downhill Champion. 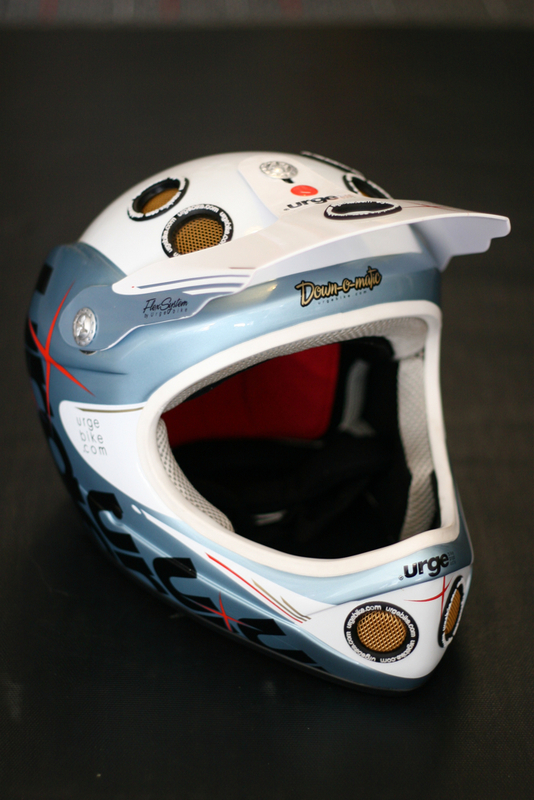 Along with the Mondraker Team riders, Fabien has created some of the most attractive helmet designs across 4 different models (Down-O-Matic, Endur-O-Matic (review to come), Archi Enduro and Dirt-O-Matic). 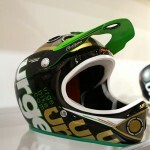 Urge helmets are available in select shops or at Huck-n-roll.com. They are distributed in the US by South Shore Bicycles out of Colorado. 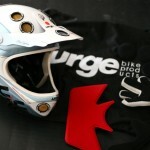 More information on Urge helmets can be found at urgebike.com. GOOD: Racer design. Awesome finish and visceral appeal. Light-weight. Cool venting. High-quality protective bag. Overall a great value at $179.95 retail. BAD: After 3 months of use, the interchangeable padding shows some wear. 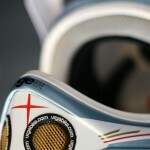 The visor hardware is soft and will strip if over-tightened. Limited goggle support. Ya buddy! Good review and credit too! Thanks. Enjoyed the session. There will be more opps in the future. Sorry for the delayed response. 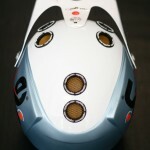 Archi Enduros have a bigger opening so it could accommodate a larger goggle. DIY – Give your pedals a bigger bite!